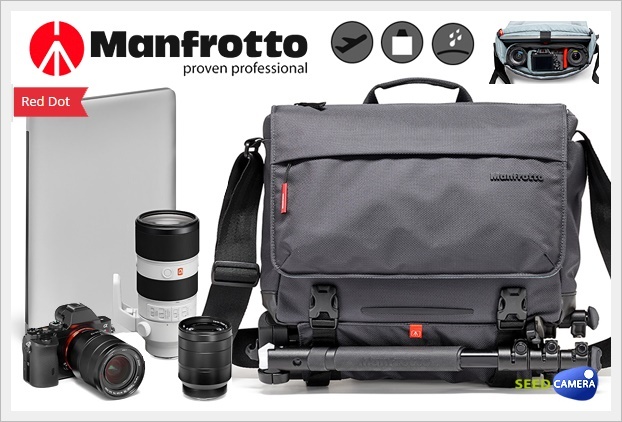 The Manfrotto Manhattan camera and laptop Speedy 10 Messenger is perfect for city commuters and people who are always on the move with their photography kit. The Manfrotto Manhattan bags are designed to be carried from home to work or anywhere while you travel, if that maybe walking or cycling. With their urban look, they will be your perfect companion for your everyday city shoot ! Thanks to its internal branded removable insert, the Speedy 10 Messenger can fit a premium mirrorless camera (Compact System Camera) like a Sony A7 or Fujifilm XT series with standard zoom lens attached plus two additional lenses, or an entry level DSLR like a Nikon D3400 or Canon EOS 1300D with lens attached plus two additional lenses. The new Flexy Camera Shell, an innovative protection system engineered by Manfrotto, enables you to easily turn your bag into a DSLR or CSC holder. With its red flexi dividers you can configure your bag to suit your photographic needs ! For the first time your camera will follow your daily needs! The Speedy 10 also fits a 12” laptop or iPad Pro 12.9”. It is also equipped with a stabilization strap that allows you to easily travel by bicycle with the peace of mind that your gear will remain in place without any risks. By connecting it to the movable shoulder pad, you will have the full function of this feature. However, if you need the useful smart sleeve for your trolley you can attach the strap to the back part of your bag. But you will take advantage of your bag for any single need. If you want to take your tripod with you, secure it with the NeverLose tripod flap by just unzipping the pocket on the coated bottom section of the bag. Just connect it to the front buckles and you are ready to go. You will never miss a moment thanks to the quick zippered opening positioned on the top; open the zip, take out your camera and enjoy the shot! If you don’t need to take your gear with you, by removing the internal pouch you can use your messenger bag as an everyday media bag. Great attention has been placed on selecting the best materials: high quality ballistic fabric protects your bag from scratches and the coated material on the bottom part allows you to easily clean your bag. All external fabric is treated making it water repellent and a rain protector is also supplied just in case of adverse weather conditions. - Interchangeable Dividers Both modular and easy to use, these dividers allow you to custom fit the inside of your bag around your gear by creating the exact size compartment for your gear..
- External Tripod Connections This bag comes with the option and proper connections to attach your tripod externally. - Rain Protector Included fold out protector which when installed creates a barrier between the wet outside and dry inside of your bag. - Trolley Connection For easy wheel along transportation simply slide the designated strap connector over any standard trolley or luggage handle. - Flexi Dividers These custom designed dividers have the option to fold out of the way when needed or to be pulled out to protect your equipment in special situations.